Lake Huron Beaches are some of Ontario's best beaches. 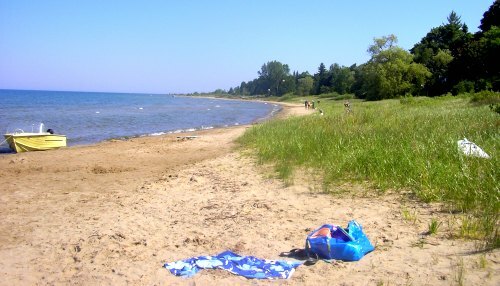 All along the Lake Huron shoreline you will find natural dune beaches that offer families a chance to play by the lake. Some beaches are famous for their boisterous long weekend parties while others are found in sleepy cottage towns. Some have deep wavy waters while others are shallow and temperate. This is a guide to the best Lake Huron Beaches. Grand Bend - Grand Bend is found along Lake Huron's Southern shores and has wide beaches that cater to teens and families alike. Weekends can be busy and intimidating in this cottage town but if you know where to look you can find a quiet unclaimed portion of beach. Also check out the Pinery Provincial Park. Bayfield - While many people visit near by Grand Bend, Bayfield has beaches of its own. A mixture of rock and sand beach offer a quieter experience to the craziness that can be Grand Bend. Port Elgin - Port Elgin has two main beach areas. The most obvious is the one adjacent to the Marina found at the base of Green street. The other is Gobles Grove which is just out of town and is more secluded of the two options. The township between Southampton and Port Elgin also has some swim-able areas but watch out for either rocks or reeds. Southampton - The whole shoreline of the town of Southampton is covered with beautiful dune beaches stretching from South Beach all the way to the Saugeen River. The busiest beach is found right around Gerry's Fries. Sauble Beach - Much like Grand Bend, Sauble Beach is well known to the party set. The main strip is teaming with people shopping and heading for the beach. Park right on the beach and play in the waves but watch out for the undertow! And did you know that Sauble is french for sand? Oliphant - There is more sand than water at Oliphant. Known for its low tide and the fishing islands Oliphant is also a favoured spot for kite boarders. Red Bay - One of the first places that Lake Huron warms up in the summer the shallow waters make for a family friendly beach environment. Red Bay Beach is also a favourite of wind surfers. Return HOME from visiting Lake Huron Beaches.